Grow your company to new heights with world’s best open source CRM. Sell more efficiently and maximize your revenue, while keeping full control of your own data. 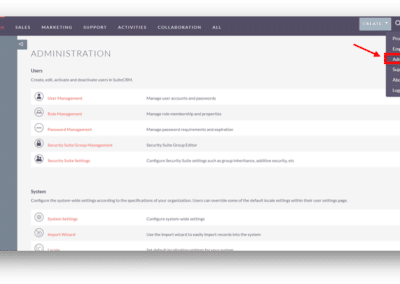 Let IGTech365 manage your SuiteCRM instance with the well documented and powerful admin tools. Support is available from IGTech365, providing ease of mind without having to invest in your own IT department. 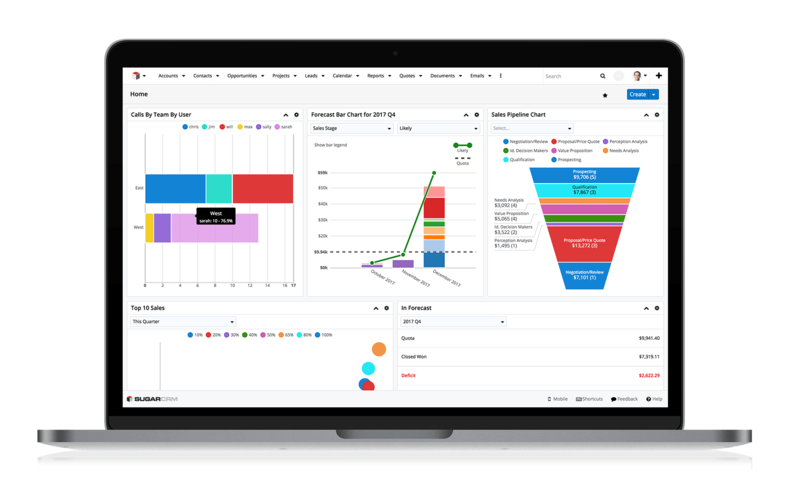 By creating a central repository of your customers, SuiteCRM provides you with a 360-degree view of all important activities, as well as rich history. You get an overview of all accounts, contacts, open/closed opportunities and more enabling you to drive value and detect new sales. All your opportunities are well organized, and the ease of managing them allows you to spend your time on closing opportunities and generating revenue! Get the most out of your sales funnel. 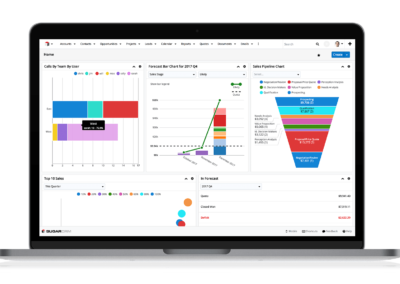 Real-Time dashboard reporting gives you visibility of key insights and the sales pipeline. The advanced reporting module allows you to create your own custom reports, which can be loaded into your own dashboards. 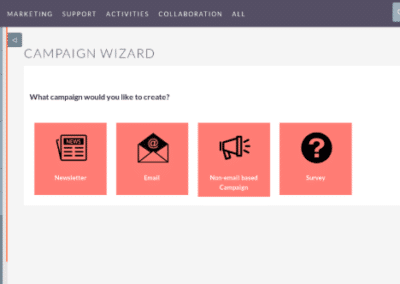 Use the web form template Wizard to create embeddable forms to capture leads on your website, assigning them automatically to the right campaign. Capture and understand where your leads are coming from will help you improve the customer journey. Create lists of prospective or existing customers, and nurture them with newsletters, emails, and non-emails campaigns. Use the powerful newsletter editor to create stunning emails, and monitor the results of your campaign in real time. Use the Workflow module to automatically add leads to the right campaign, and to deliver the right message at the right time. Automatically detect leads that qualify for sales, and assign them to the right sales agent, tailored to your own business logic. Using marketing tools like Mautic, Mailchimp or others? 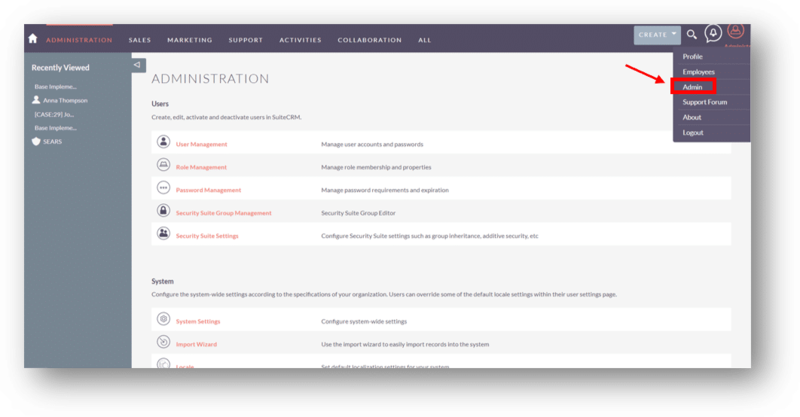 SuiteCRM comes with a powerful API, and there are many plugins available. Create a seamless integration with the tools you use and get the best of both worlds. The self-service portal allows you to manage all your customer issues through an easy to setup and use website. Your service teams will be instantly notified of customers issues and your customers will automatically be informed as soon as their issues have been dealt with. 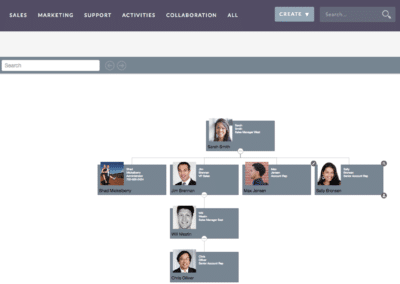 Easily customize the CRM to fit the needs of your company. 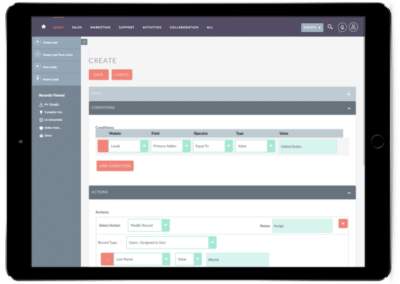 Use the Studio to create custom module fields, layouts, and relationships, and use the extremely powerful Security Suite Group Management feature to control what your users can access, locking down sensitive data to specific groups or teams. The Rest API allows you to seamlessly integrate the CRM with other software in your company, creating a highly efficient and robust IT environment that enables the company to focus on their core activities. 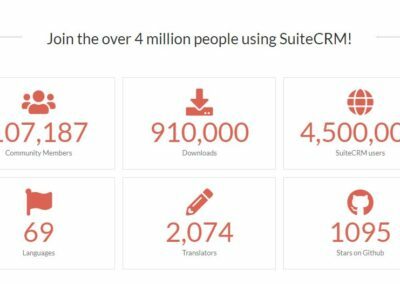 SuiteCRM is fully featured, robust, scalable and open source, making it the best CRM on the market. Unlike other CRM’s there are no limits on number of users or features, and there is no vendor lock-in. Starting with SuiteCRM, or migrating from another CRM to SuiteCRM, is the safe choice that will save you money and time. With SuiteCRM you can create campaigns, send out mailings, automate marketing tasks and see the results in reports. Improve your marketing, grow the interest in your product or service and send better leads over to sales. With SuiteCRM you can deliver the best service to your customers with less effort. Use the Cases module for efficient and organized communication with your clients and incorporate template responses to save time. All the customer communication is saved in the CRM, providing you with a complete overview of the provided service, and the ability to detect where you can improve. 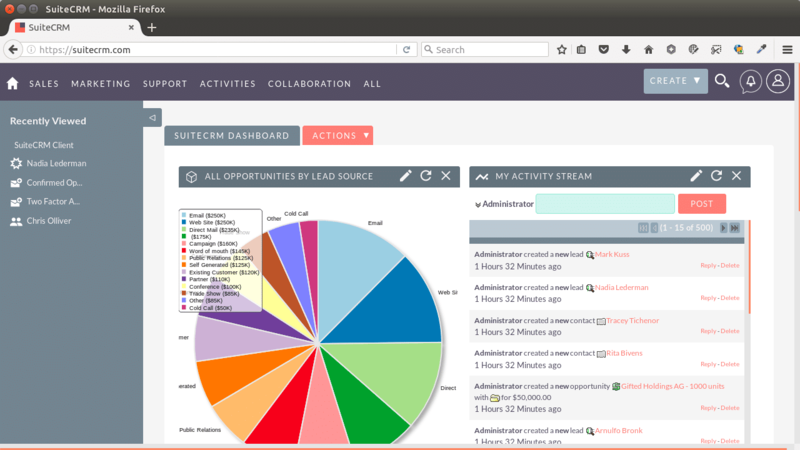 With SuiteCRM you are in full control over your own CRM. You decide where you deploy the CRM, on-premise or in a cloud, and you have full control over all the data and code. 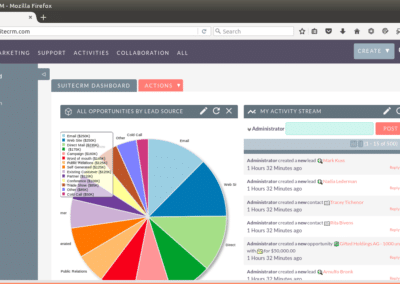 SuiteCRM is deservedly described as the world’s most popular open source CRM. Out of the box it is a great program that replicates virtually all of the needed tasks of others CRMs that have monthly user subscriptions. It is also very easy to find programmers to add additional functionality, even if you personally do not know programming. 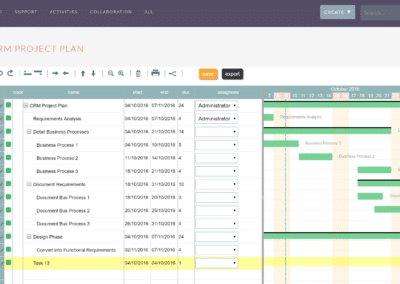 I have been able to add an almost complete company workflow into the software as well as have it connected to other large datasets related to my business. And I own all of the customizations, code and data while not being overly locked into another company’s proprietary system.